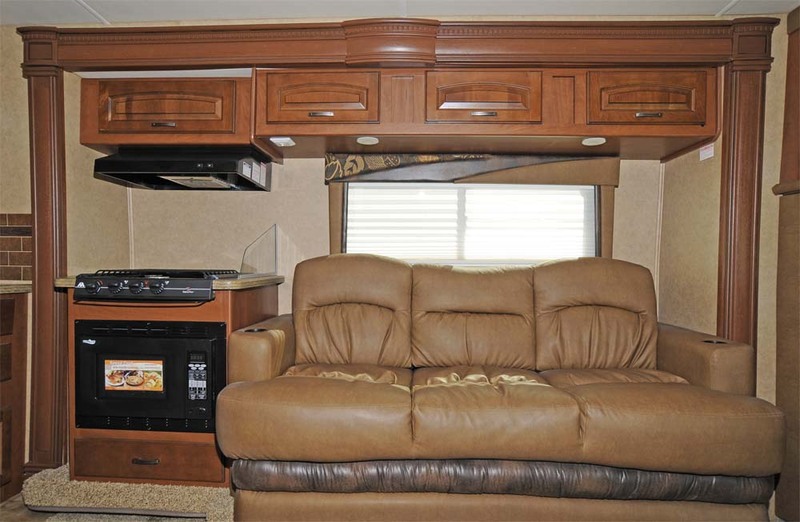 Twin slide-out sections create a very spacious living area, ideal for an active RV family. 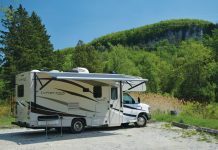 For many Canadian families, the first choice in a motorized RV comes from the class C category – with ample on-board storage and an affordable price tag, these units represent excellent value in a package that is easy to drive and outfitted for many years of camping enjoyment. 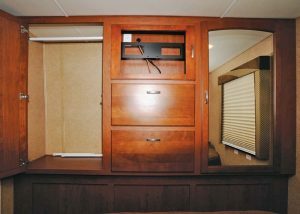 The front of this class C motorhome features an entertainment centre with LCD TV – in our test unit, the TV was waiting to be installed. The galley is compact, but full-featured, with cooktop, microwave, and stainless steel sinks. The 6 cu. ft. refrigerator is on the opposite wall. 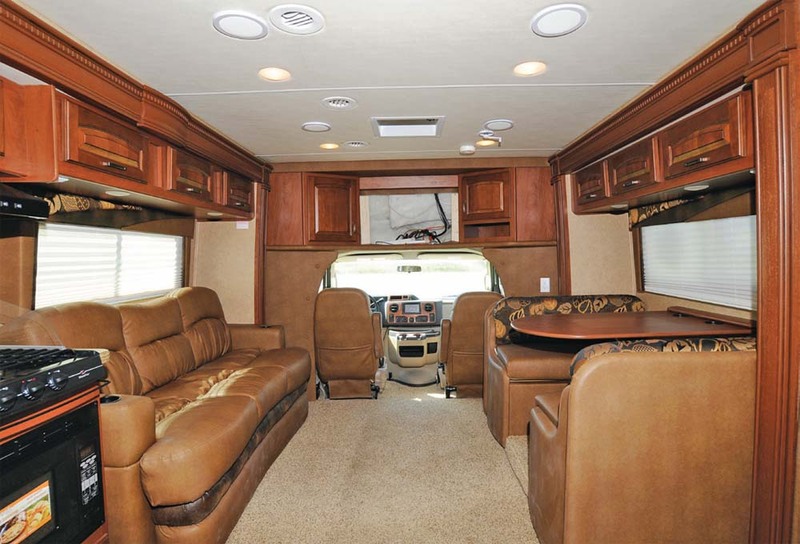 The Optima leather lounge is supremely comfortable, and converts into a 52″ x 60″ bed. We visited Owasco RV in Oshawa, Ontario to test drive a Melbourne 29D motorhome – a popular model that embodies all of the traditional Jayco RV quality coupled to the proven Ford E-450 chassis. Jayco has a 45-year tradition of excellence in RV design and craftsmanship. 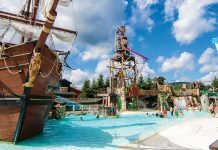 The largest family-owned and operated RV manufacturing company in North America, Jayco has always placed a very high value on customer relations, and the Middlebury, Indiana plant tours are a popular attraction throughout the year. Step up on the fiberglass running boards and slide into the Optima leather driver seat with 6-way power adjustments and Optima leather passenger seat, and you and your navigator will be ready to enjoy what our road test teams often refer to as “vroom with a view”. 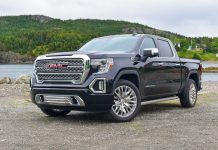 All of the features you would expect in a top-quality class C chassis are standard equipment – including A/C and cruise control, 5-speed automatic Torqueshift series transmission with overdrive, and a 130-amp alternator. We always enjoy driving units built on this chassis – it combines the power and responsiveness of the 305 HP 6.8L Triton V-10 engine, and the smooth handling of a MOR/ryde frame with Hellwig helper springs. We were impressed with the ride and handling of the Michelin LT225/75R16 LTX M/S tires on aluminum rims. The motorhome comes with a 5,000- lb. 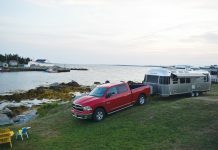 hitch with 7-way plug, and a 55-gallon fuel tank that should be sufficient for a full day on the road at highway cruising speeds, depending, of course on road and weather conditions, the weight of your cargo and passengers, and your driving habits. 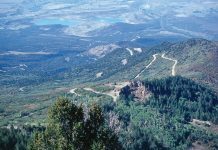 We did not have the opportunity to evaluate the long-term fuel efficiency of a loaded motorhome, but the drivers who deliver the units to the dealerships tell us that you can expect approximately 12 miles per gallon under average conditions. There is a significant degree of technology in this frame – the extended chassis features a robotically welded one-piece assembly with laser-shear tight fit construction for excellent handling and very low vibration. On the road, the Melbourne has enough power to easily keep up with highway driving requirements, while delivering a reasonable degree of fuel efficiency for a motorhome of this type and size. 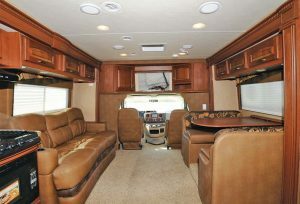 It is always refreshing to road test a vehicle that has been designed by RV enthusiasts for active camping families. Every aspect of the Melbourne reflects the experience of the 1,600 Jayco employees – from the design and engineering of a motorhome with all of the features in the most appropriate locations, to the fit and finish that can only be achieved by old-world craftsmen, this motorhome delivers excellent value at a reasonable price. 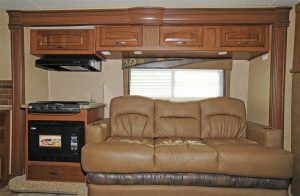 We were particularly impressed by the elegance of the Washington glazed maple cabinetry and the comfort of the Optima leather lounge with matching decorative pillows – for touring or relaxing in the campground, the Melbourne 29D earns an “A” in the class C motorhome category. The Lumbercore screwed-style cabinet construction is solid and very well finished inside and out. Deluxe hidden cabinet hinges enhance the beauty of the raised panel cabinet doors, and all of the galley drawers feature ball bearing drawer guides with 75-lb. capacity and full-drawer extension. The Melbourne 29D comes with a front entertainment centre that includes a 32” digital LCD HDTV, in our test model, this TV was in the process of being replaced – you can see the open space in the photograph. 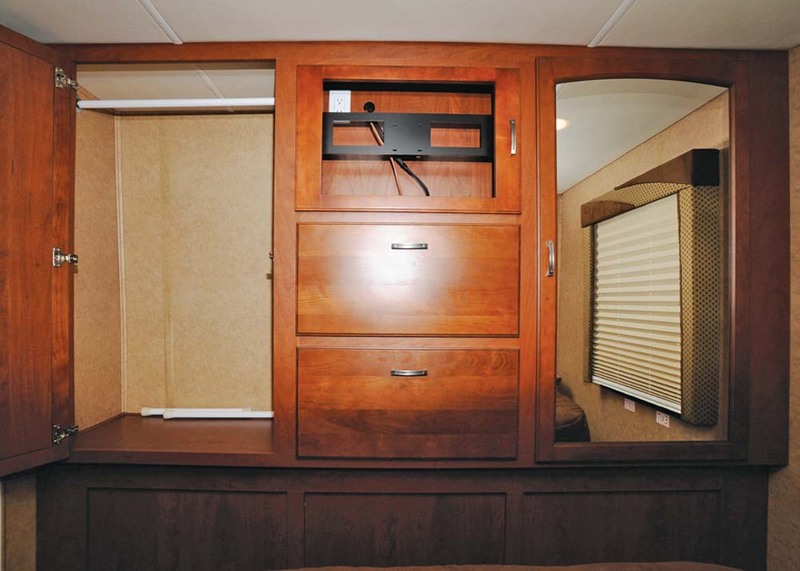 Jayco builds RVs to last, using stateof- the-art technology and materials. We toured the plant last summer and we were fascinated by the combination of old-world craftsmanship and modern manufacturing processes. 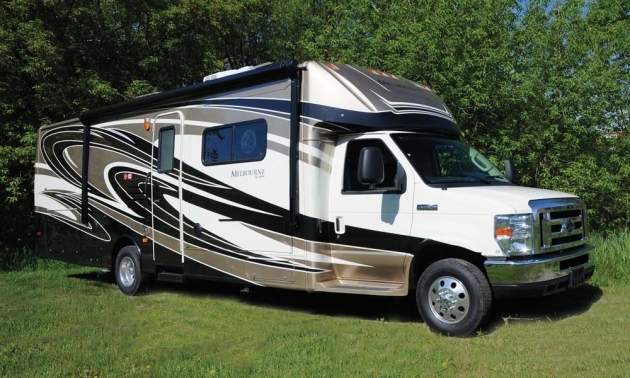 The Melbourne starts with a Ford E450 chassis, and Jayco adds a welded aluminum frame that is lightweight and durable. The unitized 1-1/2” laminated construction Structurwood floor is comprised of vacuum-bonded layers, assuring a solid foundation for the vehicle. The welded aluminum framework sidewalls are also constructed using vacuum bonded layers – we watched the process as 144 tons of pressure were applied for a period of 15 minutes to achieve the strongest bond – the finished sidewalls have a high-gloss gel-coat fiberglass exterior that is painted and then coated with Diamond Shield paint protection. The front and rear fiberglass caps are gel-coated for easy maintenance. The seamless front cap enhances aerodynamics and assures leak-free durability for the life of the vehicle. There is a full wall of closet space at the foot of the bed. Curved sidewall construction contributes to a sleek and aerodynamic profile, and every detail matches the flow of the design. We like the radius-cornered entrance door with electric power step, the radius corner door screen and the keyless entry touchpad. The heavy-duty grab handle is an excellent safety item, especially when the steps are wet. The TuffShell vacuum-bonded laminated roof is a sandwich that includes ¼ inch plywood decking on 5-inch arched welded aluminum trusses and a onepiece fiberglass shield exterior. The roof features R-23 bead-foam insulation and a padded ceiling. Floor insulation is rated at R9, wall insulation is R9. Overall, the materials and construction used in the Melbourne provide very efficient thermal insulation as well as absorbing road noise and ambient campground sound. 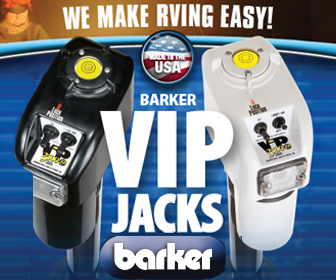 Holding tanks are heated with 12V pads for year-round operation. 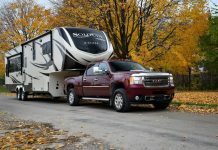 It only takes a few minutes to settle in to your campsite – and the process is even shorter when you specify the optional hydraulic auto leveling jacks. 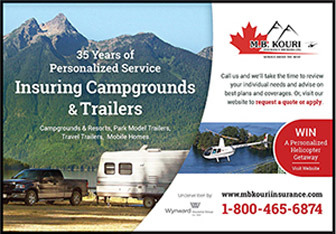 We always follow the same procedure when we arrive at our campsite – position the vehicle in the optimum location on the site, set the brakes and/or chock the wheels, level and stabilize the unit, connect the electrical hookup, extend the slides, extend the awnings, and connect the water and sewer hookups. Our test vehicle was equipped with a Carefree 12V Travel’r electric patio awning that extends in seconds at the touch of a switch, and retracts just as easily. Our slide-outs were protected by awning toppers – a great idea, but always remember to clear any leaves or snow that may accumulate on these surfaces before you retract the slides – the roof ladder makes this a very simple process so long as you do not have acrophobia. 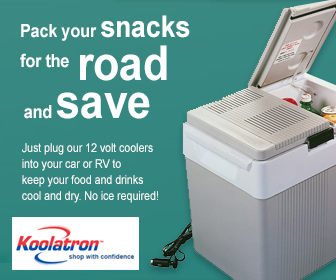 The Melbourne’s RV systems include a 12V electrical system with 110V, 60-amp power converter and a 120V G.F.C.I. protected exterior receptacle. The 30-amp power cord hookup is conveniently located, as are the water and sewer hookups. There is a convenient exterior shower, and a holding tank sprayer. All of the exterior storage compartments are lockable. 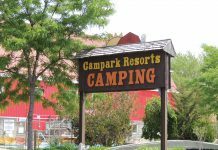 For dry camping, the 12V demand water pump works very well, when you park in a full-serviced site the campground’s water supply system provides the necessary pressure. Our test vehicle was equipped with an Onan 4,000-watt MicroQuiet generator with auto-changeover – a definite plus if you enjoy camping in remote areas. 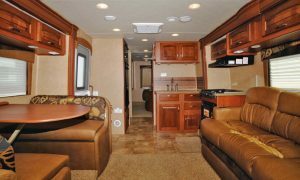 While the galley in the Melbourne 29D is compact, it features a full range of facilities, including an under-counter Apollo convection microwave, a 3-burner cooktop, range hood, and a 6 cu. ft. refrigerator. Your food preparation area features a one-piece J-Stone solid-surface, high-gloss countertop with integrated deep bowls with twin sink covers. Brushed nickel fixtures and the high-rise, single-lever faucet with pull-out sprayer are very stylish and a Plexiglas splash guard protects the galley wall covering. 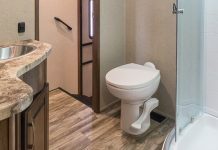 The Melbourne 29D has a water purification system for the galley, and the resi- dential linoleum floor in the kitchen area is very easy to keep clean. There is trackless carpeting with padding throughout the balance of the motorhome. The Melbourne 29D is a very comfortable way to travel, and a great place to entertain family and friends. Bright and spacious during the day, it is a very cozy and inviting environment in the evening, when you can enjoy the relaxing atmosphere created by the undercabinet halogen lighting. This is a very spacious floor plan, with lots of open space and a generous 78” ceiling height. 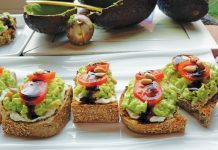 Entertaining in the Melbourne 29D is a pleasure for host and guests. The front LCD TV is easily seen from the dinette and lounge seats, and the sound system is very good for a vehicle of this type. You have two high-output marine speakers on the exterior wall of the unit, for occasions when you want some mood music at the campsite. 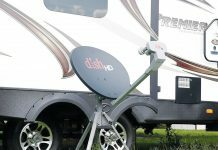 Our test vehicle was equipped with a 22” digital LCD HDTV in the bedroom and a crank-up digital TV antenna with signal booster. The motorhome has an RG-6 coax cable TV hookup, which is great if your campground offers cable TV service. The vehicle is prepped for satellite dish that can be installed on the roof or sidewall. The rear bedroom features a 60” x 74” queen-size bed with Cloud Ten pillowtop mattress and a full wall of closet space at the foot of the bed. Your quilted bedspread matches the décor – there are fabric-covered box valances with lambrequin legs on the windows, and day/ night shades on the tinted safety glass windows. For a family of 4 – 5 people, the Melbourne 29D offers an ideal combination of accommodations – the Dream Dinette mechanism lets you raise or lowers the dinette table top with ease, and this area provides an ideal place for two small children to sleep. The comfort lounge converts into a 52” x 60” bed – just enough for a little leaguer, but not quite large enough for a basketball player. The bathroom is spacious and well-equipped, with a residential-style porcelain toilet with foot flush, a generous vanity featuring a stainless steel sink, and a large ABS shower with one-piece surround and skylight. Our road test vehicle was outfitted with the Customer Value Package, including a Touch-Screen in-dash sound system with built-in GPS and CD/DVD with MP3 input jack, back-up and sideview camera and monitor, a 15,000-BTU A/C with heat pump, 400-watt inverter, outside grill, remote control and heated mirrors, and on-demand tankless water heater. 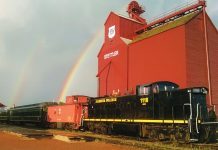 The vehicle was finished in the Sundance Gold paint package. Jayco motorhomes are covered by a 2-year limited warranty – for details, please consult your local Jayco dealer. 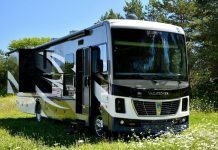 For comfort and convenience, quality of materials and workmanship, and overall touring enjoyment, the Jayco Melbourne 29D is an excellent example of applied RV technology, at a price that will bring smiles to the faces of any RV family.